In 1889 the London County Council (LCC) inherited land from the Middlesex, Surrey and Kent Counties in accordance with the 1888 Local Government Act. This served the purpose of eliminating the Metropolitan Board of Works and creating a body that would take their place. With this, the LCC took over the problem of the ever growing Lunatic population of London and with the four institutions that they took over from both the Middlesex and Surrey Counties, they were still unable to provide sufficient accommodation. The institutions that they took were Cane Hill, Hanwell, Colney Hatch and Banstead; they also took over the building of the Middlesex Asylum, Claybury. They also took over the Metropolitan Asylums of Caterham, Leavesdon Tooting Bec and Darenth Training Colony. In order for the LCC to control the Asylums that they had taken over operation of, they set up the LCC sub-committee. The committee were responsible for the daily running of the Asylums, and the planning of the new ones and the Commissioners of Lunacy over seeing them. As soon as the LCC Asylums Committee had taken office, the swiftly received a letter from the Lunacy Commission stating that even upon the completion of Claybury, they would still not have sufficient provision for their Lunatics. They were ordered to look into the construction of a number of small asylums that would hold a total of 2000 patients, or one larger asylum that could hold the same number. Whilst the committee was looking into building the new asylums, they took intermediate steps to counter the problem. This was done by construction temporary steel structures within the grounds of the Colney Hatch and Banstead Asylums. They also sent some lunatics to other institutions around the country. With the Lunacy Commission pressing for a solution, and the inmates housed within institutions around the country, the bills were mounting up and LCC needed to act fast. They set about purchasing land at Bexley and employing G.T.Hine to design and build them a new Asylum. Even before the building was complete, the Commission presented another letter to the LCC stating that they were going to still be short on beds and that they would require a further building. This caused the LCC to again begin searching for land to build yet another Asylum on, they eventually learned of the Horton Estate outside Epsom, which comprised of over 1000 acres (enough to house six 2000 bed asylums). The price was also very attractive, at a meagre £35,000, although it was eventually bought by the LCC for £40,000. 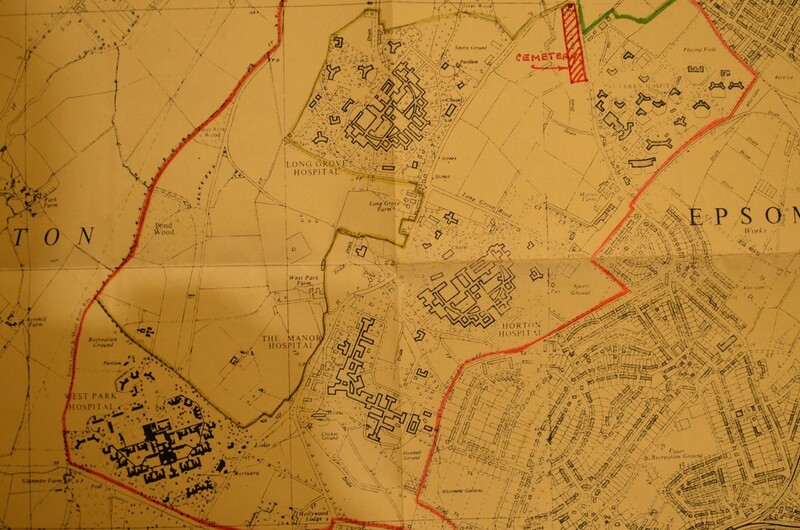 This met with some opposition from the locals as the number of hospitals that the site could hold would double the population of Epsom, although the locals were powerless to act as the purchase was endorsed by the Home Secretary. As soon as the land had been purchased, the committee set about planning their new asylum, but to counter the growing need for beds they set about converting the Manor House on the estate to a temporary hospital. This met with stiff opposition from the Lunacy Commission as they proposed to build a 700 bed female hospital out of the temporary shelters they had used earlier. This was on the understanding with the Commission that the buildings would be demolished after five years of use (some of the old wards still stand and are used by a garden centre). The LCC, on grounds of cost, wanted to use the buildings for 25 years, but the committee refused. The hospital was built anyway and became known as The Manor Asylum. The LCC, wishing to replicate the buildings at Bexley for the purpose of speed, asked G.T.Hine to produce them a carbon copy that could be used on the Horton estate. In building the Asylum, they discovered that the estate lay on a large seam of Clay, which the Commission decided to use for the manufacture of bricks to use on the rest of the buildings on the estate  this explains why Horton and the central services were built in the light coloured London brick. With the construction work progressing at a fast rate, the LCC began to fill the completed male side of the Hospital before the entire site had been finished. Unlike Claybury, Horton, like Bexley, was a very plain hospital. The Epsom Cluster was unique by the way of the five psychiatric hospitals being in such close proximity to each other, with this, the LCC looked to ways of reducing the costs of running them all. They introduced a central boiler house to provide the necessary services to all the hospital, the agricultural services were also centralised, with smaller units being constructed at each site. The building works employed 100 epileptic patients that were housed as the Manor Hospital. This use of epileptic patients showed that they were industrious and were not suited to be housed within a large asylum . This caused the LCC to do something revolutionary, and that was to build a working colony for male epileptic colony that was relatively free from the restraints of a typical asylum. With the Manor, Horton and St Ebbas sites functioning and caring for the lunatics from London, the committee begun to think of constructing their next Asylum on the grounds. Having built Horton as a replica of Bexley, the LCC committee wish to design their own Asylum and for this they set up a working party that would study foreign asylums and begun its work in 1897, two years before Horton was founded. In 1902, as the LCC were beginning to plan their 10th asylum, the party reported that out of all the Asylums that they visited, the Maryland Asylum was their most favoured. This was because the wards were broken down into autonomous blocks that could function as a small community. The LCC committee were very keen with their recommendations and immediately set about commissioning the design, and to accommodate the expected patient increase they set about planning more temporary structures at The Manor. Unfortunately the design never left the drawing board and the LCC quashed any temporary huts that they were planning. This led them to again commission G.T.Hine to build them a new asylum that would be able to cope with the demand; this was Long Grove hospital and did not reflect any of the research carried out by the working party. Instead it was an adaptation of the Horton/Bexley design, again used for speed. At the time of the building of Long Grove, the forecast increase of patient numbers begun to decrease, thus causing the LCC to defer the building of their 11th asylum. Interestingly, the LCC wished to purchase a new site for the building of their next asylum, but for financial reasons, the bean counters did not allow this. At the same time, Dr Henry Maudsley approached the Committee wishing to donate £30,000 for the construction of a voluntary hospital to treat up to 100 patients, this hospital was built in inner London and work almost independently from the larger asylums. Patients werent treated because they had become certified, but because they were identified curable cases that did not require housing within an asylum. 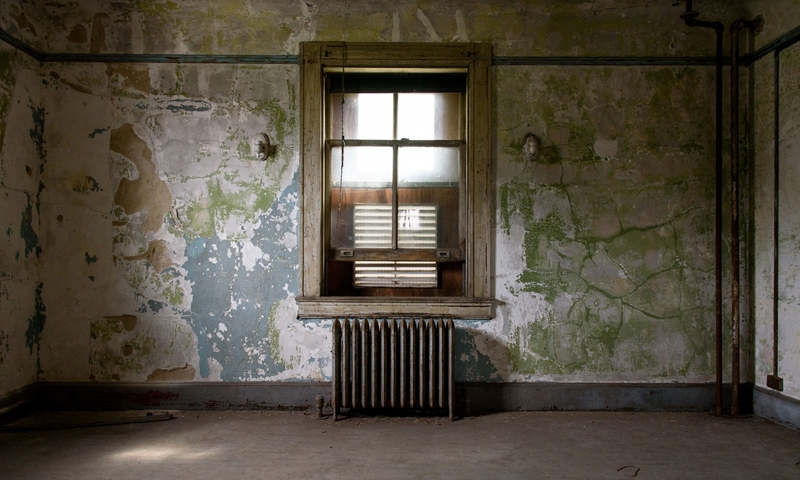 The overall cost of this asylum was ten times that of the construction of Horton and Long Grove, but undoubtedly saved many people from being admitted. The last great asylum to be built within the Horton Estate was West Park, this time the LCC had time to commission a special design that would meet the findings of the Working party. However, in the views of money and the damaging cost of WW1, the LCC met with a compromise. Unlike the continually connected wards of the previous hospitals, West Park was built so that the wards were self-serving pavilions, but laid out on the same U-shaped foot print as the Compact Arrow formation. West park actually lies on earth excavated from the Northern Line. West Park, like St Ebbas, viewed their patients differently and ran a parole scheme throughout the hospital, allowing patients to leave the site, a year after its opening, West Park could boast four open wards. The Epsom cluster went on to serve London up until the creation of the NHS, and provide mental health treatment for close to a century. Only recently has the final hospital closed down  although auxiliary buildings are still in use for various health roles. All that remains now is various converted buildings, a marker showing the graveyard and a scattering of road names reflecting the hospitals. Information reference from Asylum, Hospital, Haven – A History of Horton Hospital, Ruth Valentine ISBN 0952830604 and please visit Ewell History for more information.